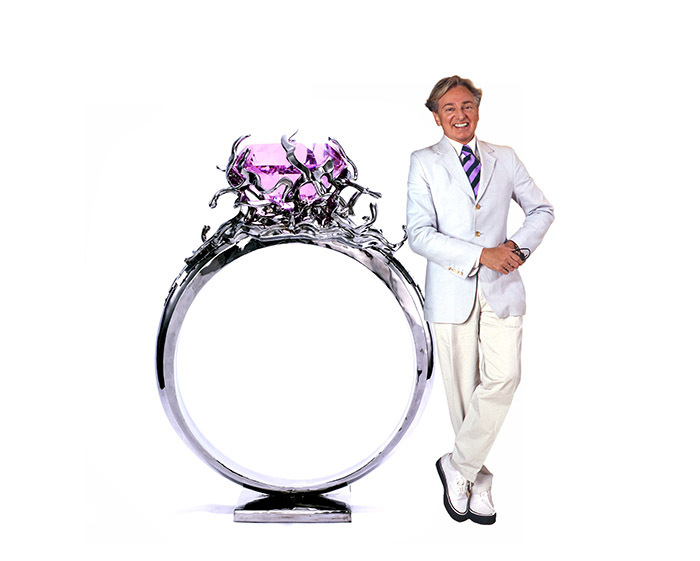 Geoffrey Bradfield with Liao Yibai's Fake Ring, Pink Iceberg (2010). Refined, luxurious, exquisitely curated, fearless, bespoke, and completely of the moment—these are the essential elements of Geoffrey Bradfield’s signature style, sought after by Fortune 500 clients and others for whom the firm long ago coined the phrase “silent celebrities,” which include some of the most prominent aristocratic and royal families in the world. Among Bradfield’s many highly celebrated projects are: a major overhaul of Gertrude Vanderbilt Whitney’s Westbury, Long Island estate, restoration of the late King Hussein’s mansion in Maryland, and the design of Hollywood director Oliver Stone’s riverside New York apartment. Geoffrey Bradfield Inc. is headquartered in New York. "I am particularly intrigued with burgeoning Asian artists," Bradfield shared with us. "Their creative vision puts a new spin on the genus. Among the many, Liao Yibai's current collection “Real Fake” is stunning. I am also enamored with the work of the Luo Brothers and Sui Jianguo, whose pieces I have showcased in famed movie director Oliver Stone’s New York residence."